The bad news is clear. Israel's right to exist is questioned by many, and its ancient and present capital, Jerusalem, is unrecognized by all but a few states. Israeli leaders are sometimes compared to leaders of Nazi Germany, and Israeli actions against the Palestinians are described as Nazi-like policies. Moreover, the Israelis are accused of engaging in South African apartheid policies toward the Palestinians and the country's Arab minority. Opponents and critics portray the Jewish state as the world's worst violator of human rights, United Nations resolutions, and international law. While European guilt over its colonialist past facilitates the acceptance of the Palestinian-as-victim narrative and while the latent, traditional anti-Semitism that culminated in the Holocaust has never been eliminated, Israel is still not quite the pariah of Europe as some think. 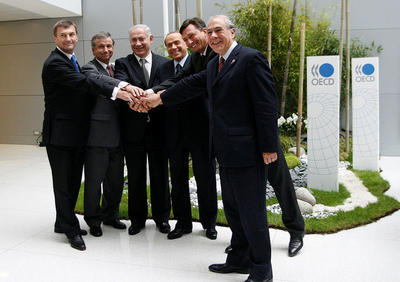 In May 2010, Prime Minister Netanyahu (third from left) joined hands in Paris with leaders (left to right) Andrus Ansip, Estonia; Felipe Larrain, Chile; Silvio Berlusconi, Italy; Borut Pahor, Slovenia, and Angel Gurría, secretary general of the Organization for Economic Co-operation and Development, when Israel was formally admitted into the exclusive organization. As a result of these global attitudes, many Israelis feel their country to be once more alone and increasingly isolated in the international community. An August 2010 poll showed that 56 percent of Jewish Israelis subscribed to the view that the "whole world is against us." Even a larger majority, 77 percent, thought that it made no difference what the Israeli government did and how far it might go on the Palestinian issue: The world would continue to be critical regardless of the facts. The extensive media coverage of the April 2002 "Jenin massacre" fabrications, the infamous Goldstone report of September 2009, and the Gaza "Freedom Flotilla" of May 2010, among other things, provided evidence to Israelis of hostile international press reporting, which buttressed their perceptions that Israel is under international siege. Israel's political leaders have repeatedly expressed their concern about the country's international status. In March 2011, for example, Defense Minister Ehud Barak warned about a "diplomatic tsunami" if the standstill in peace talks with the Palestinian Authority (PA) continued, adding that a massive campaign to delegitimize Israel was underway. In July 2012, Tzipi Livni, at that point the opposition Kadima leader, suggested that "Israel is facing a difficult time right now, perhaps the most difficult in our history … This is a continuous process under which Israel is becoming isolated from the world." And the most systematic argument about Israel's growing isolation was made in a Reut Institute 2010 report underscoring the dangerous effects of an international campaign to boycott Israeli products, disinvest from Israeli firms, and subject the Jewish state to international sanctions. Yet, the greater isolation apprehended by many is primarily impressionistic. A closer look at Israel's interactions with many powerful international states and less-powerful international organizations shows such evaluations to be wrong and provides a more nuanced and less pessimistic picture. In fact, Israel's international status has improved since the height of its isolation in the 1970s. For decades, Arab governments have refused to accept the establishment of a Jewish state in the Land of Israel and tried to eradicate it by force. Parallel attempts were made to deny legitimacy to Israel and isolate it in the international community. The isolation/delegitimization component of the anti-Israel strategy has been adopted explicitly by the Arab states since the 1964 Arab summit, which, as its leaders put it, "called for the regulation of relations vis-à-vis foreign countries in accordance with their position regarding the Palestine question and other Arab causes." Israel was viewed as a Western-established bastion in the Middle East, and well before oil was used as a weapon, Arab leaders aimed to insert a wedge between the West and Israel in order to weaken the Jewish state. The isolation strategy, based on the soft power concept of manipulating cultural and monetary "currencies," became more pronounced as it became clearer to the Arab states that eliminating Israel by military means was not achievable in the near future. The nonmilitary nature of this isolation campaign reflected to some extent Israel's success in diverting the Arab-Israeli conflict from large-scale conventional war to the diplomatic arena. The isolation campaign has been directed at neutralizing Israel's superior military power and maximizing the legal, political, and cultural constraints upon Israel's use of force. There are several obvious ways to measure isolation. The first and most obvious is tallying the number of states that have diplomatic relations with the outcast country. A second criterion is membership in international governmental organizations and agencies. A third measure is the amount of negative attention a state receives in international forums and public opinion. In accordance with these criteria, the 1970s stand as the worst decade for Israel in diplomatic terms. The 1973 Yom Kippur War was a military debacle for the Arab states, but it was answered by the Arab-led Organization of Petroleum Exporting Countries creating a global energy crisis. This placed the power of the Arab world at its zenith and created unprecedented isolation for Israel. An avalanche of Asian and African states severed diplomatic relations with Israel. These nations joined the communist states that, with the exception of Romania, had severed relations after the 1967 Six-Day War. In the 1970s, the U.N. and its affiliated bodies were also the setting for a tsunami of anti-Israel resolutions. The Arab bloc of more than twenty states regularly garnered the support of the Third World and the Soviet blocs to endorse rabid, anti-Israeli resolutions there and in other international organizations. During that period, the Arab League even tried to have Israel expelled from the U.N. The worst of the U.N. resolutions, from Israel's point of view, was the November 1975 General Assembly resolution branding Zionism, the Jewish national movement, as racism. In spite of heavy U.S. lobbying against it, seventy-two countries voted in favor of the resolution; thirty-five opposed it, and thirty-two abstained. The resolution demonstrated the decreasing international legitimacy of the Jewish state even more profoundly than the severance of diplomatic ties. In December 1979, the U.N. again denounced Zionism as a form of racism. This time the deterioration in Israel's international status was strikingly evident. Only three countries, the United States, Canada, and Australia, opposed the resolution. No Western European, Latin American, Asian, or African state voted with Israel. An overwhelming 111 nations supported the resolution; only twenty-six abstained. Moreover, the 1979 resolution did not even arouse the indignation of the global public as the 1975 anti-Zionist resolution had, an indignation that was one of the reasons the resolution was not resubmitted earlier. Interestingly, the signing of the 1979 Egyptian-Israeli peace treaty, a tremendous step in improving the Arab-Israeli dynamics, had no immediate impact on Israel's international status. Instead, it was Egypt that was ostracized by an Arab world that continued to oppose Israel's mere existence. The U.N. also refused to lend its backing to the Sinai peacekeeping force designed to supervise the implementation of the demilitarization clauses of the peace treaty. Even Washington had difficulties recruiting foreign contingents for the multinational force it sponsored to supervise in the Sinai. The temporary decline in U.S. clout in the 1970s influenced the fortunes of its allies including Israel. Since 1991, Israel's international status has greatly improved as many states decided to upgrade or to establish diplomatic relations with the Jewish state, partly due to the emergence of the United States as a hegemonic global power. With Jerusalem's foremost ally the winner of the Cold War, many states were eager to profit potentially from its good links with Washington. Beyond this, the USSR disappeared, along with the Soviet bloc, with its wide-ranging military, economic, and cultural support for the Arab states and the venomous anti-Semitism the Soviets and the Arab states espoused. In addition, Israel's diplomatic status benefitted from the disappearance of several inhibiting factors. First, changing trends in the oil market lessened the political leverage of the Arab bloc in world politics and of the oil-producing states in particular. By the end of the 1980s, the fears of energy crises had subsided substantially with the oil market becoming a buyers' market, thus diminishing the weight of Arab objections to the enhancement of relations with Israel. Second, the Arab-Israeli peace process, reactivated by Washington with great fanfare in the wake of the 1991 Kuwait war, further marginalized the objections by Israel's regional enemies to third-party ties with Jerusalem. The October 1991 peace conference in Madrid, a formal gathering with Israel to which almost all Arab countries sent senior diplomatic delegations, served as a convenient pretext for hitherto reluctant states to develop closer relationships with Israel. Another important factor that pushed states to seek cooperation with Israel was the challenge of terrorism and radical Islam in the post-9/11 era. The Jewish state has much to offer in the area of intelligence as well as tactical and doctrinal counterterrorism. Because of the growing Islamist threat, the number of states seeking security relations with Israel is on the rise. There are many countries that fall in this category, and they are hardly deterred by the intractable Israeli-Palestinian conflict from useful interactions with Israel. Israel has also emerged as an economic success story in the post-Cold War era, augmenting the political and military attraction of pursuing good relations with Jerusalem. This is due to its beneficial economic policies and effective adaptation to a globalized economy. Moreover, its high-tech sector has turned Israel into a global actor. Beyond its well-established reputation for producing first-rate military equipment, Israel has also excelled in agriculture, medicine, communications, and a variety of other fields. All of these accomplishments have created international admiration and keen interest in bilateral exchanges and trade relations. Finally, Israel seems to have weathered the global campaign of boycott, divestment, and sanctions (BDS) waged by the Palestinians and their Western supporters since July 2005 to limited effect: A number of artists have refused to perform in Israel while Israeli performers abroad often encounter hostility, demonstrations, and aggressive efforts to cancel their performances; economic boycott campaigns urge companies to stop doing business with Israel with activists calling, writing, and picketing corporate offices and stores with anti-Israel slogans. Belgian, Basque, and Norwegian trade unions approved the boycotting of Israel and divesting their pension funds from Israeli firms or from companies that do business with Israel, and the Presbyterian Church in the United States deliberated the same option. Yet so far, the BDS campaign has failed to make a real impact on Israel's flourishing economy or cultural life. Israel has clearly benefited from the international systemic changes. Measuring the number of states that have diplomatic relations with Israel indicates an improvement in the country's international status. For example, after the end of the Cold War, all former states of the Soviet bloc and most Afro-Asian states have opted for diplomatic relations and have maintained them ever since. Significantly, major international players such as Russia, India, and China, as well as pivotal regional states, such as Turkey and Nigeria, also capitalized on the changes in the oil market and the better Middle Eastern atmosphere to establish full diplomatic relations with Israel in 1992 without facing too much Arab furor. Similarly, other Asian states, such as Laos, Cambodia, and Vietnam, renewed their diplomatic ties with Jerusalem in that period. The upgrading of relations with Israel was, therefore, part of a larger post-Cold War international phenomenon, characterized by the desire to normalize relations with an important emerging international actor, and was intended to tap both advanced Israeli technologies and Jerusalem's influence in Washington. There also exists a high level of friendly relations toward Israel and the Jewish people within the two most populous and dynamic states on the world scene: India and China, rising powers in every sense of the word. Both are old civilizations that have not been burdened by anti-Semitic baggage as has Europe. They treat the Jewish state with reverence perhaps because they see it as a similar older civilization that has attained remarkable achievements. Israel has been successful in forging a strategic partnership with India, and most Asian states, even if they vote against Israel in international forums, have a similar attitude. Similarly, countries on the Pacific Rim, the emerging focal point for international action, are usually pro-Israeli. South Korea and Australia are prime examples. Sub-Saharan African countries also contain very pro-Israeli circles for a variety of reasons, notably fear of militant Islam; additionally, they welcome Israeli expertise in the areas of agriculture, medical services, and communications. Significantly, relations with predominantly Arab Muslim countries have improved. Israel has peace treaties with Egypt and Jordan, as well as informal dealings with several Arab states in the Persian Gulf and in the Maghreb. Most Arab states, however, still adhere to the 2002 Arab League Peace Initiative. While this peace plan is not acceptable from an Israeli perspective, at least the Arabs are talking peace, not war. This implies a de facto recognition of Israel, which would be a historic change in their positions. Israel conducts extensive if quiet trade relations with a number of Arab states, and the Arab economic boycott has lost much of its impact. Fears over the Iranian nuclear threat place Sunni Arab states' differences with Israel on the Palestinian issue on the back burner while the recent regional upheavals have kept the Arab regimes preoccupied with their domestic affairs with the same effect. Israel has also established cordial and fruitful relations with Muslim states that emerged from the dissolution of the Soviet empire in the Caucasus and Central Asia. Israeli presence is felt in states such as Azerbaijan, Kazakhstan, Turkmenistan, and Uzbekistan. The Muslim identity of their populations does not hinder relations with Jerusalem in areas important to their national interests. Their sensitivity to the imagined or real misfortunes of the Palestinians is very low. However, the rise of Islamists in the Muslim world is problematic for Israel as they usually view the Jewish state as a religious aberration. The 1979 Islamic revolution in Iran turned the country into an archenemy of Israel. Turkey's fall under the spell of the Islamist Justice and Development Party has generated an anti-Israeli change there as well. The growing Hamas influence in Palestinian politics is not enhancing the already slim chances of reaching the coveted historical compromise with the Palestinian national movement. Indeed, the greater political clout by Islamists in the Arab world as a result of the recent upheavals, particularly in Egypt, jeopardizes the historic regional peace process, which constituted an acceptance, however reluctant, of Israel as a fait accompli in the region. The cold peace with Egypt might become even cooler, but the initial behavior of the Cairo Islamists has revealed some caution on their part. The need for economic support from Washington may have a moderating effect although religious zeal could trump rational considerations in the final account. The Islamist surge may also quietly improve perceptions of Israel by still moderate states. It must be emphasized that ties with the most important country in the world, the United States, have greatly improved since 1973, and this increasingly institutionalized, strategic relationship is still very strong, despite the misguided Middle East policies of the Obama administration. It is noteworthy that the level of U.S. public support for Israel has remained remarkably stable for the past four decades at around 65 percent. This also translates into congressional support. Israel is still popular in the United States primarily because of public perceptions and not because of any Jewish lobby. President Obama may have been influenced by this popular sentiment in adopting a friendlier posture toward the Netanyahu government. Yet, there is a clear danger that part of the international discourse demonizing Israel has entered mainstream America. Former president Jimmy Carter has used the word "apartheid" when referring to Israel while professors at elite American universities question Israeli democratic credentials. While Israel seems to be more criticized on American campuses than in the past, an October 2012 study showed that 97 percent of U.S. and Canadian college campuses report no anti-Israel or anti-Semitic events, indicating that the BDS movement has failed there. No major American university has divested from Israel; in fact, at almost every college that held a vote on divestment, the pro-Israel camp was successful. Europe's relationship to Israel is an entirely different matter. Its strategic culture with no threat perception and where the use of force is seen as anachronistic makes Israel a difficult pill to swallow. Jerusalem's intermittent use of force to achieve a modicum of deterrence and quiet along its borders attracts criticism. Nevertheless, European governments have supported Israel's right to self-defense as long as its exercise does not cause large numbers of civilian casualties. European guilt over its colonialist past facilitates the acceptance of the Palestinian narrative of the Palestinians as victims of colonialist-imperialist schemes. Furthermore, Israel, a U.S. ally, is disliked due to widespread anti-American sentiment among Western European elites. All this is reinforced by latent, traditional anti-Semitism that singles out the Jews as responsible for the problems of the world. More than any time in recent history, European Jews feel harassed and physically threatened. Belgium, Ireland, Norway, and Sweden, in particular, display anti-Israeli positions bordering on anti-Semitism. Fortunately, none are core European states. Some European universities have become unpleasant places for Israelis (and Jews), and a large portion of the European intelligentsia is anti-Israeli and even denies Israel's right to exist. It is also true that much of the elite European media is biased against Israel and has helped shape negative perceptions of Israel and Israelis. At the same time, France, Germany, and Italy, the EU's power centers, have been ruled in recent years by leaders (Sarkozy, Merkel, and Berlusconi, respectively) who have a soft spot for Israel. The bilateral relations of these states with Israel are flourishing. Significantly, the EU itself decided to upgrade its relationship with Israel in September 2008. In October 2012, the European parliament ratified the Agreement on Conformity Assessment and Acceptance of Industrial Products, which recognizes Israel's industrial standards as equivalent to those in Europe, especially in health care. According to David Saranga, head of the European Parliament Liaison Department for the Israeli Mission to the EU, "This will lead to facilitating imports of high-quality, low-cost Israeli medicines into the EU." In 2011, the EU was Israel's largest trading partner with annual trade amounting to 29.4 billion euros—an increase of 45 percent from 2009; and this came in the midst of an unprecedented financial crisis in Europe. Influential pockets of strong pro-Israeli sentiment are still present in all Western European states. A few even view Israel's struggle as a vanguard of their own beleaguered Western civilization, threatened by moral relativism and Islamic fanaticism. The growing fears of Muslim immigration in Europe provide an important corrective to European views on Israel. Another factor working in Israel's favor is the expansion of the European Union. "New" Europe, the Eastern European states, is very different from its western counterpart. Its strategic culture is still dominated by a historic threat perception of Russia and as result is more understanding of the dilemmas associated with the necessary use of force by Israel. The Czech Republic stands out as one of Israel's best European friends as do Albania and Poland. Generally, most states are not ready to hold their relations with Jerusalem hostage to the vicissitudes of the Israeli-Palestinian dialogue. One can also detect the beginning of weariness with the Arab-Israeli conflict and an attitude perhaps described as "a plague on both your houses." Some Europeans have even begun to realize that the Palestinians have a vested interest in not ending the conflict and propagating the victim image as a means for continued financial support from gullible Western donors. Most international forums remain extremely anti-Israeli, and Israel continues to be singled out as the culprit for a variety of "sins." For example, among the resolutions adopted by the U.N. General Assembly in 2012 that criticized states, twenty-one focused on Israel while only four criticized other states. But since no real change has taken place in the anti-Israeli atmosphere in the past decades, it is difficult to conclude that the Jewish state's position has worsened in such international organizations. Nevertheless, Israeli diplomats feel that the U.N. has become less hostile and is, therefore, an arena where Israel has greater leeway than before. Attempts to eject Israel from the U.N. during the 1970s and 1980s ceased in the post-Cold War era. It is worth mentioning that in December 1991, the U.N. rescinded the 1975 U.N. General Assembly resolution condemning Zionism as racism. Israeli diplomacy adopted an exit strategy for the 2006 Lebanese war that envisioned a U.N. Security Council resolution and a U.N. peacekeeping force in south Lebanon. Although a faulty strategic choice, it reflected to some extent a new Israeli evaluation of the U.N. institution. Prior to May 2000, Israel was the only U.N. member state excluded from a U.N. regional grouping. Consequently, it could not sit on any U.N. body where membership in a regional group was required and could not be elected to leadership positions on most U.N. bodies. However, as a result of intense efforts, Israel became a temporary member of the Western European and Other States Group (WEOG) in May 2000. Israel's admission to WEOG marked a step toward its full integration into the U.N. system. In recent years, Israeli diplomats have become more intensively involved in the work of U.N. agencies. Jerusalem even promoted U.N. resolutions over the past few years and hosted U.N. sponsored conferences. Israel's international aid agency, Mashav, is supported by the U.N. and other international agencies. The Korean diplomat Ban Ki-moon, U.N. secretary-general since 2007, is seen in Israel as more sensitive to Israel's diplomatic predicament than his predecessors. In May 2010, Israel was also admitted to the exclusive club of the Organization for Economic Co-operation and Development, which brings together the thirty-three most developed countries in the world that are committed to democracy and the market economy. Prime Minister Binyamin Netanyahu emphasized that beyond the considerable economic significance of Israel's admission, the move was important diplomatically because it showed that regardless of the political process, Israel had a "place among the nations due to its economic and technological prowess." Similarly, Israel became an associate member of the prestigious European Organization for Nuclear Research (CERN) in September 2011. The Israeli ambassador to the U.N. in Geneva, Aharon Leshno-Yaar, who signed the agreement, said, "The agreement is testimony to Europe's recognition of Israel's scientific and technological capabilities, of the quality of its scientists, and of its contribution throughout many years to the research activities of CERN." Membership in CERN was an additional building block in Israel's involvement in scientific projects in Europe. Here, too, Israel's enhanced position is based on European perceptions of its own self-interest rather than ideological alignment. Nevertheless, the Palestinians and their political allies have been successful in maintaining a delegitimization campaign against Israel, particularly since the U.N.-sponsored World Conference against Racism that took place in September 2001 in Durban, South Africa. The Durban conference crystallized the "Red-Green" alliance between radical leftist and Islamist groups that share tremendous hostility toward Israel. This alliance is the spearhead of delegitimizing Israel as an apartheid regime through international isolation. This approach, dubbed the Durban strategy, made use of a myriad of nongovernmental organizations (NGOs), which generally use the rhetoric of human rights, humanitarian relief, and international law. The unwarranted emphasis NGOs have placed on the Israeli-Palestinian arena and, specifically, their numerous condemnations of Israel have been central in the disproportionate attention of the media to alleged Israeli misconduct. While certainly effective in creating an anti-Israeli atmosphere, the Durban strategy has had only very limited success in imposing official sanctions via boycott and divestment campaigns. More recent efforts to have goods manufactured in West Bank Israeli communities labeled or banned have gained greater force. Another real and growing problem for Israel is the phenomenon of "lawfare." Anti-Israeli groups exploit the legal system of Western states to criminalize Israel, Israeli government officials, and senior Israel Defense Forces officers in these states and in international forums through universal jurisdiction statutes and local lawsuits alleging human rights abuses and war crimes. Several states have been sensitized to this issue and have taken legislative actions to remediate the situation. This is particularly true of states operating military forces beyond their borders such as the United States, United Kingdom, and France, which could face similar attacks. Isolation in the international community is more often than not connected to the international power configuration. Normative considerations obviously have little impact on the decision-making of those authoritarian states that obsessively accuse Israel of human rights abuses in international forums. The U.N. Human Rights Commission is notorious in that respect. To a large extent, Israeli international fortunes are linked to U.S. international status. Indeed, the growing weakness of Washington, particularly since the presidency of Barack Obama, has exposed its small ally Israel to somewhat harder times. For example, Israel was excluded from the Global Counterterrorism Forum in the summer of 2012. Reports suggest that the Obama administration acquiesced in Israel's exclusion at the behest of Turkey and Arab members of the forum. Diminishing U.S. clout has also been unable to overcome Turkish objections to Israeli participation in NATO exercises. Isolation of a state is intended to prevent it from interacting with other members of the world community. Different indices for measuring integration show, however, that Israel is rather well integrated globally. The general aggregated 2012 KOF Globalization Index ranks Israel as number 30 out of 166 states. When Israel's economic performance is measured, it ranks 23 in the world, reflecting its growing economic successes. When its social interactions are measured, Israel ranks 32. Israel's lowest measure is political where it ranks only 58 out of 166 states. This is measured by the number of embassies in the country, membership in international organizations, participation in U.N. National Security missions, and ratification of international treaties. Yet, even the lower score puts Israel ahead of almost two thirds of the states in the world. Moreover, the KOF index shows steady increase in Israel's globalization performance since 1993, indicating that its integration in the world community has been little affected by its regional conflict. Nevertheless, taking into account that Israel cannot benefit from association with a big international bloc, such as the developing countries, Muslim bloc, or with regional blocs such as Latin America or Asia, the Jewish state is doing quite well on the international scene. It is definitely not isolated more now than it had been in the past. Why Is There an Isolation Discourse? Obviously Israel is not a normal country in terms of its international relations. Moreover, Jews are historically conditioned to sense isolation and delegitimization: Even in the Bible, the prophet Balaam called the Jewish nation "a people that dwells alone." The Jewish prism on international relations could amplify the sense of isolation although Israelis seem to have developed a certain immunity to U.N. hostility and negative media coverage. Although the Arab-Israeli conflict has gradually become less central to regional and global dynamics, it still carries weight that interferes with Israel's quest for equality and recognition in the world community. This generates a certain measure of isolation that the Jewish state has been successful in overcoming on its way to becoming a strong and prosperous nation. Nevertheless, Israelis have been denied the Zionist dream of normalcy, of becoming a nation just like the others. Many circles in the Arab and Muslim world, as well as radical leftist groups in the West, still question Israel's legitimacy. And they are not bashful about working to eliminate the Jewish state. Isolation discourse and concrete efforts to isolate Israel internationally are real and deeply troubling even if the evidence shows they have been progressively less successful since the 1970s. The confrontation between Israel and Iran also reinforces feelings of insecurity and isolation. Many Israelis are bewildered by the world's tolerance of genocidal Iranian discourse. After all, with the exception of Canada, which severed relations with Iran, the international community is reacting slowly to Tehran's nuclear buildup, mostly ignoring threats by Iranian officials to erase Israel from the map. Israeli concerns are reinforced by Jews in the Diaspora who display political awareness and care about Israel's image. A poll among diaspora Jews would probably reveal acute feelings of isolation since as a minority they are more sensitive to anti-Semitic and anti-Israel attitudes. Taking into consideration the many examples of negative media coverage of Israel, such feelings in the Diaspora are understandable. Many Jewish organizations in the Diaspora and Israel's non-Jewish friends therefore give priority to battling the BDS campaign. Another important voice in the isolation discourse is the Israeli Left. It argues vocally that the continuation of the conflict with the Palestinians and Jerusalem's settlement policies exact a heavy price on the Israeli state because it is becoming an isolated and less legitimate political entity. These leftists are influenced primarily by their reference groups, the Western Left and its radical offshoots. Ascribing exaggerated importance to the Palestinian issue and to Israel's isolation, they advocate the urgent need for a deal with the Palestinians even at a heavy Israeli price. Moreover, parts of the Israeli (and American Jewish) Left, increasingly frustrated by the fact that the Israeli electorate prefers parties to their right, see no alternative but outside intervention to impose a solution to the conflict aimed at "saving" Israel from itself. This requires denigrating the Israeli democracy, which adds ammunition to Israel's detractors. The Zionist revolution and the expectations of the emergence of a "New Jew" and a normal nation generated the belief that Jews could be treated like anybody else. Yet Israel, the Jewish state, is on many occasions still singled out for a variety of reasons that have nothing to do with what the Jews are doing. However, the anti-Israel behavior of international organizations and opinion makers is not the only element in Israel's interactions with the world. A closer look at Israel's relations with countries near and far, as well as with international institutions, belies the claim that it is isolated. In fact, Israel is increasingly acknowledged as a world player in view of its social, economic, technological, financial, and diplomatic achievements over the past sixty-five years. Continued high Israeli Jewish fertility rates, immense new energy reserves, innovative water technologies, and a frenetic pace of cultural production are all prominent features of modern Israel. There are significant parts of the world that appreciate what the Israeli state is doing and try to emulate its successes. Israel's struggles against its implacable opponents also touch many responsive chords around the world. Moreover, even its use of force is largely accepted as legitimate in the West as exemplified by the support lent to Israel during the October 2012 "Pillar of Defense" operation in Gaza against Hamas. But the bottom line is that realpolitik considerations dictate good relations with the Jewish state in many parts of the globe. As long as Israel is a U.S. ally and Washington plays a crucial role in world politics, the effects of isolation can be cushioned. So far, Israel has weathered many challenges despite attempts to isolate it. Its international status has improved over the years. But its struggle to gain legitimacy is not over, and it may never end, as long as there are people that adhere to extremist ideologies, be they secular or religious. Efraim Inbar is professor of political studies at Bar-Ilan University, director of the Begin-Sadat (BESA) Center for Strategic Studies, and Shilman-Ginsburg Writing Fellow at the Middle East Forum. The author thanks Steven David, Efraim Karsh, Amichai Magen, and Shmuel Sandler for their helpful comments. Efraim Karsh, "The War against the Jews," Israel Affairs, July 2012, pp. 319-43; Michael Curtis, Should Israel Exist. A Sovereign Nation under Attack by the International Community (New York: Balfour Books, 2012). The Jerusalem Post, Aug. 20, 2010. Ha'aretz (Tel Aviv), Mar. 13, 2011. "The Delegitimization Challenge: Creating a Political Firewall," Reut Institute, Tel Aviv, Feb. 14, 2010. Efraim Inbar, Outcast Countries in the World Community (Denver: Denver University Press, 1985), pp. 11-53; Deon Geldenhuys, Isolated States: A Comparative Analysis (Cambridge: Cambridge University Press, 1990), pp. 97-105, 130-6, 149-56, 176-8, 194-200, 240-51. Representatives of Algeria, Iraq, Jordan, Kuwait, Lebanon, Libya, Morocco, Saudi Arabia, Sudan, Syria, Tunisia, United Arab Republic and Yemen, to the President of the Security Council, S/6003, Oct. 8, 1964. Joseph S. Nye, Jr., Bound to Lead: The Changing Nature of American Power (New York: Basic Books, 1990); idem, Soft Power: The Means to Success in World Politics (New York: Public Affairs, 2004). Efraim Inbar and Alvite Singh Ningthoujam, "Indo-Israeli Defense Cooperation in the Twenty-First Century," MERIA Journal, Dec. 2011; see also, P.R. Kumaraswamy, "The Maturation of Indo-Israeli Ties," Middle East Quarterly, Spring 2013, pp. 39-48. Ha'aretz (Tel Aviv), Jan. 19, 2012. "Americans Continue to Tilt Pro-Israel," Gallup Polls, Washington, D.C., Mar. 2, 2012. Jimmy Carter, Palestine: Peace, Not Apartheid (New York: Simon & Schuster, 2006). John J. Mearsheimer and Stephen M. Walt, The Israel Lobby and U.S. Foreign Policy (New York: Farrar, Straus and Giroux, 2007), pp. 86-91. The Jewish Journal (Los Angeles), Oct. 23, 2012. Robert S. Wistrich, A Lethal Obsession: Antisemitism from Antiquity to the Global Jihad (New York: Random House, 2010). See, for example, "Manifestations of Anti-Semitism in the European Union," EU Monitoring Center on Racism and Xenophobia, Brussels, accessed Dec. 17, 2012. Robin Shepherd, A State beyond the Pale. Europe's Problem with Israel (London: Weidenfeld and Nicholson, 2009). Arsen Ostrovsky, "Israel Winning in Europe," Ynet News (Tel Aviv), Dec. 14, 2012. Fiamma Nirenstein, Israel Is Us (Jerusalem: Jerusalem Center for Public Affairs, 2011). Author interviews with European diplomats, Tel Aviv, spring 2012. U.N. Watch Briefing, Geneva, Nov. 29, 2012. Interview with a senior Israeli diplomat, Jerusalem, July 2012. The Jerusalem Post, May 11, 2010. Globes Business Daily (Rishon Le-Zion), Sept. 18, 2011. Gerald Steinberg, "Soft Powers Play Hardball: NGOs Wage War against Israel," in Efraim Inbar, ed., Israel's Strategic Agenda (New York: Routledge, 2007), pp. 135-55. Barak M. Seener, "Targeting Israelis via International Law," Middle East Quarterly, Fall 2009, pp. 43-54. Charles J. Dunlap, Jr., "Lawfare: A Decisive Element of 21st-Century Conflicts?" Joint Force Quarterly, no. 3, 2009; news release, The Lawfare Project, New York, accessed Dec. 17, 2012. "The Politics of Counter-Terrorism, the U.S., and Leaving out Israel," The Atlantic, July 30 2012; CNS News, Dec. 6, 2012. 2012 KOF Index of Globalization, Eidgenössische Technische Hochschule Zürich, accessed Dec. 17, 2012. CNN Wire, Sept. 9, 2012. Related Topics: Israel & Zionism | Efraim Inbar | Spring 2013 MEQ receive the latest by email: subscribe to the free mef mailing list This text may be reposted or forwarded so long as it is presented as an integral whole with complete and accurate information provided about its author, date, place of publication, and original URL.